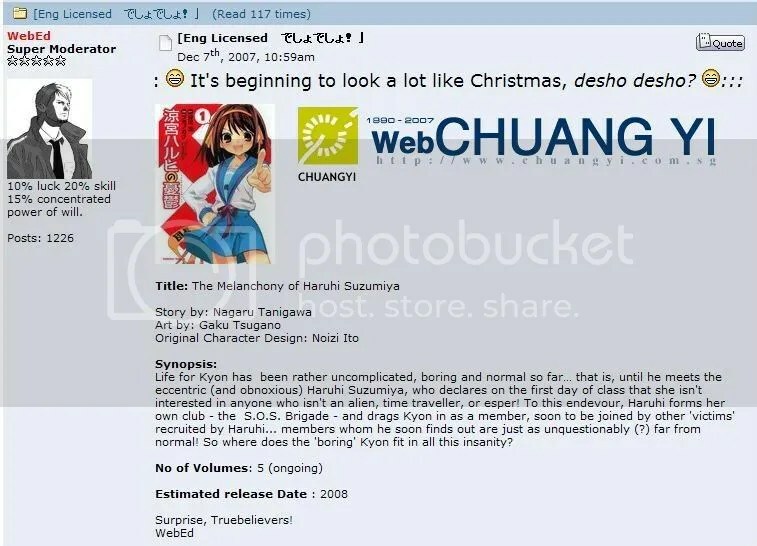 It might not be the original light novels, but Chuangyi is still the first company to have licensed the Suzumiya Haruhi no Yuutsu manga version, announced on the Chuangyi forums here(you need membership to view). It’s going to be out early 2008, under the English translated title ‘The Melancholy of Haruhi Suzumiya’. Image stolen from Akayuki’s blog. Excuse me while I fangirl more over Chuangyi’s EPIC WIN-ness. In your face, tokyopop/VIZ/DHM/Del Rey!